Texas A&M quarterback Johnny Manziel is a bigger fan of Drake than many realized. 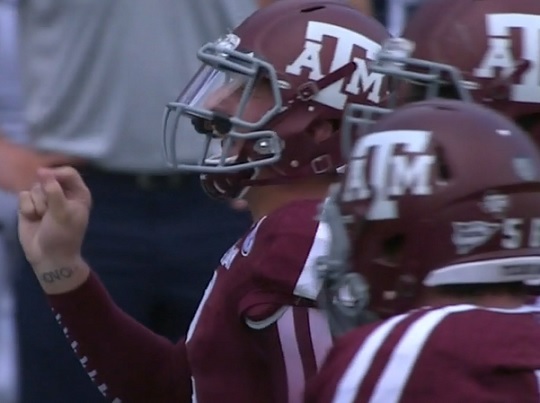 Manziel debuted a new ‘OVO’ tattoo on his inner right wrist during A&M’s 52-31 victory over Rice on Saturday. OVO stands for “October’s Very Own,” which is Drake’s birthday month and the name of his recording label. Manziel, who has been spotted in Drake’s OVO gear on several occasions, admitted that meeting with the Canadian rapper was the highlight of his offseason. Johnny Football claims he learned the most from Drake and felt he related the most to the rapper during his tumultuous offseason. Manziel also has a bible quote tattooed on his upper right chest. His mother won’t be pleased with his new ink because she admitted she cried after he told her about his chest tattoo. She believes it doesn’t represent Texas values. Meanwhile, Manziel continues to rub some people the wrong way. After the 2012 Heisman Trophy winner served his first half suspension for signing thousands of autographs for memorabilia dealers, he used his autograph scandal as a form of trash talk. Its unclear what a Rice defender told Manziel but he made the gesture after the two exchanged words on the field. He also made a money gesture after he throw a 23-year touchdown pass to Mike Evans. Watch the two gestures below.